I know for sure that businesses with a truly awesome, customer-focused USP (Unique Selling Point) are successful at competing without having to cut prices, retain their target customers for longer and are more likely to generate a healthy return on their marketing investments. Read this article for some tips and insight into how to create your USP, and download my free Awesome USP Playbook here. Then work through the activities I’ve created for you – they will take about 30 minutes to complete and by the end of it you will have an outline USP statement that you can develop to be used in your marketing, customer and employee communication. The purpose of this article is to provide you with an opportunity to stop and think for a few moments about your business’ USP, to challenge and stretch your thinking about it and to help you shape a succinct, meaningful and impactful USP statement. It needs to actually work and matter in the real world, especially to customers, of course. It should add value to financial performance, helping you to sell and generate customer loyalty and employee engagement. It should be something that you can keep delivering consistently. And of course, it does actually need to be genuinely unique! From my experience, too many businesses generically describe their USP as being their customer service, innovation, people or reliability, but fail to back it up with compelling communication. Plus, in reality, their competitors are often good at those things too, so there is little true differentiation. Defining your USP is sometimes not easy, so my hope is to provide you with some current examples, and then walk you through a short activity which you can download here, so that you can begin to create a more compelling USP statement for your company in a few easy steps. Is your business standing out for all the right reasons, or lost in the ‘me too’ thinking of your industry? In business it’s essential to stand out to the right people in the right way. Companies that successfully differentiate have better margins and brand loyalty. They are clear about what they are offering, to whom, why, and on what makes them different. The good news is that the USP does not have to be complex or blue sky, especially when the focus is on customer experience. I have been impressed recently by three businesses I’ve experienced as a customer that have taken an effective and inventive approach to differentiation. 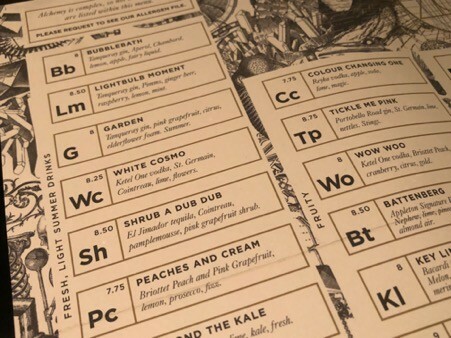 These are: The Alchemist, Everyman and a restaurant called Moules a go-go in Chester, UK. Whilst these three examples are all in the entertainment and leisure industry, entrepreneurs in any sector can adapt elements of their approaches and use them in developing and strengthening the USP statement for their own businesses. Focus is key. Trying to be all things to all people risks being expensive and ineffective. Hone in on your core strengths and deliver those with excellence. People buy with emotion and justify their decisions with logic. Connecting with customers positively on an emotional level as a key component of your USP is a smart move. Even smarter is going a step further and making the experience as personal and individual as you can. Focusing on creating a really special customer experience can be a significant differentiator. Being more creative about how products are presented, packaged and described can help to communicate and sell your points of difference. Always check in to make sure that your USP remains relevant. Stay ahead of the curve. Everything we do as a species is to make us feel the way we want to feel. It’s how we are designed. We hardly ever just buy something due to its functionality. We buy it because of how we think it will make us feel. For example, I buy mascara. Its function is to make my eyelashes look longer and more defined. The real reason I buy it is because I feel that I look prettier when I wear it. I have also been known to buy a power drill. I bought it because, as my good friend and master of selling Nick Bramley, CEO of the Impactus Group would say, I didn’t need a drill, I needed some holes. The holes meant that I could hang the curtain rail and poles which made me feel more comfy and cosy in my living room, and also feel pleased with the way the room looks. To achieve this emotional connection, it’s essential to understand your customers in detail. Trying to appeal to everyone is usually a suboptimal strategy because you can end up being a bit meh overall. Much better to target your core customer segment(s), get to know them in depth and align your business activities to meet their specific needs and aspirations. Don’t forget that, despite all the extra processes, tenders, proposals and so on that B2B clients require us to go through, they are just people in a business environment. They too make decisions based on how they want to feel, and by getting to know them you will be able to work out what that is. For instance, they may want a supplier who creates an easy life for them, or who makes them look good, or who can be trusted and relied on, or who they can get creative with. Functional. This is the basic foundation. Your product or service needs to actually serve its core function. Brand promise. The next level up is engagement through a brand that is appealing and engaging for your target customers. Customer experience. Creating an amazing experience – yes, including B2B as well as B2C customers – is where the magic really starts to happen. Personalisation. The more you are able to tailor your product or service to the specific needs of each client, the more compelling your USP will be. Amazon is one of the most frequently cited examples of this. They have literally millions of different customers, each of whom can personalise their set up and details to a significant extent. If your USP addresses all of these needs you are in a great place. If you are focused only on your functional differentiators then you have a huge opportunity to improve your competitive advantage, margins and customer loyalty by working on the other three levels. Here are some mini real examples of businesses that I feel differentiate themselves really successfully. They only take a couple of minutes to read, and they might give you some ideas, so I do suggest you read them, but if you’re short of time just skip them and click here to get straight to the activities that will lead you step by step through the process of defining your USP. The company has bars and restaurants across England and Wales, and at the time of writing, has several new venues opening soon. Having visited the Chester and Manchester venues, they absolutely deliver on their brand strapline of ‘Theatre served’, and always with a great sense of fun and customer service. They are innovative on three fronts: the products they serve, the styling of the brand and their environment, and the theatre with which their employees mix and serve the cocktails. If you’d like to learn more about their recent expansion and results, click here. The Alchemist has its own distinctive marketing and communication style, but many businesses could transfer in some of the concepts of creating theatre, experience and innovative products that really engage customers. In a recent visit to Chester, UK, and doing the usual sweep online to find somewhere good and interesting to eat, this one stood out head and shoulders above the other options in the city because it has a speciality focus – mussels and seafood (the name gives it away!). With amazing food and fantastic customer service as a given, I was impressed with this bar and bistro because they have focused on one key theme that they deliver incredibly well. Photo Dr Jo North - John Salisbury, my hubby, co-director and mussels aficionado at Moules a go-go this weekend. So many businesses try to offer too many things to too many different customer groups, almost with some sort of fear of missing out. But, as Moules a go-go have shown, if you understand and target your customers really well, and completely deliver on what they want, you literally have a recipe for success. Not everyone will like their product, and that’s fine. In fact, it’s more than fine, because they know what their target customers want and go all out to achieve that for them very successfully. The key business takeaway from Moules a go-go is to find your strength and absolutely focus on that, making sure your product and customer experience are both excellent. Everyman has the features of being a ‘blue ocean’ company. Blue ocean companies create new market space, and move away from commoditised, price sensitive competition. One of the ways that they do this is by eliminating or reducing aspects of the product or service that are not liked or valued by customers that the rest of the industry continue to offer. Blue ocean companies also create or improve the product or service by focusing on the things that really matter to customers. Limited and unexciting range of food and drinks. The overall look and feel of the venue, a more funky and sociable space. Comfort, relaxation, fun and informality through the seating style and at seat food service. For more about Everyman’s financial performance and growth plans, see here. Now it’s time to get down to thinking about the USP for your company. Here’s my simple 6-step process that should take about 30 minutes to work through. First, download my free Awesome USP Playbook here and work through the activities that I have created for you to think about your business, and put together your own USP statement. It is a great resource and, as I have said above, takes about 30 minutes or so to complete. You will be able to use the statement that you create in your marketing, proposals, employee communications and much more. If you have more than one target customer segment, you will probably need to complete this step separately for each one. A customer avatar is a representation of your target segment. Creating and then using an avatar helps you to ensure that your business activities, products and services are all designed to have maximum appeal and usefulness for your customers, increasing the impact of your marketing and the propensity of customers to buy from you. Use the graphic below to describe the Customer Avatar for your business. Use the five-sided grid below to create an overview of your most important competitors. Give each competitor a score out of 5 for each of the following, and mark their scores on the grid. Join up the marks with lines, using a different colour for each competitor. Then complete it honestly for your own business. Now step back and look at the picture overall, and make a note of your thoughts and observations. Jot down your intuitive responses to these What if…? questions in the playbook. What if you had an opportunity to give a 1 minute pitch on your USP on a prime time broadcast to your ideal customers? What would you say? What if your greatest competitors were asked for their perceptions of your business? What do you think they’d say and why? What if your most loyal, high value customers were asked to explain why they choose to buy from your business? What do you think they’d say and why? Functional. How well and uniquely does your product or service deliver its functional purpose? Brand promise. How well and uniquely does your brand appeal to and engage your target customers? Customer experience. How well and uniquely does your business create an amazing experience for your customers, whether your company is B2C or B2B? Personalisation. How well or uniquely does your business tailor your product or service to the specific needs of each client? Now review all your notes from the earlier steps, and then put them together to form your USP statement, replacing the prompts in brackets, which are there just to give you some ideas, to complete each one. XYZ Ltd is for [engineering companies in Europe] who [who use specialist widgets as an essential component in their manufacturing process]. We are [include your point of difference – e.g. Europe’s only handmade, small batch widget manufacturer, providing the highest quality widgets with guaranteed delivery within 48 hours of order to our clients’ premises]. Unlike [other widget manufacturers], XYZ Ltd is [the only specialist widget manufacturer that integrates with our clients’ systems and processes, meaning that we help make production quicker, more efficient and reliable for our customers]. Our clients say that they choose to do business with us because [they can trust us to provide an exceptionally quality of bespoke customer service every single time they order from us]. If you have any real testimonials that support this last paragraph, even better. If you enjoyed this post, I’d be very grateful if you’d help it spread by emailing it to a friend, or sharing it on Linkedin, Twitter and Facebook. Thank you.